When an Indo-Pacific bottlenose dolphin was captured in the wild and sold to an aquarium in South Korea, it seemed like her life, as she knew it, was over. Little did she know, people were working to free her. Chunsam and four other dolphins had been caught and sold illegally to aquariums between 2009 and 2010, according to Ric O'Barry's Dolphin Project. Thanks to tireless efforts of advocates on the dolphins' behalf, in 2013 the Korean Supreme Court ruled to release them back to the wild. Longtime animal advocate Ric O'Barry himself went to South Korea to prepare the dolphins for their release. After a few months of rehabilitation in a sea pen, Chunsam was ready to be free again. She was released in the summer of 2013. Three years later, sightings show not only that is she thriving - in fact, the dolphin who almost had to live the rest of her life in a tank now has a little wild family of her own. Chunsam's baby was born earlier this summer. 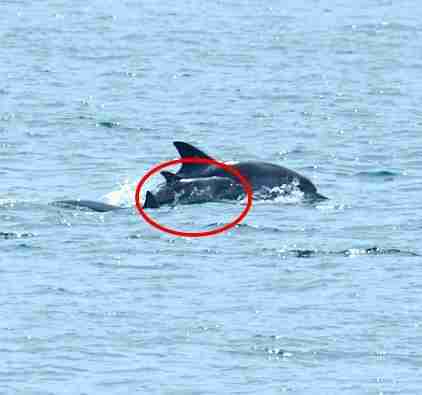 Since then, the pair has been spotted numerous times by a dolphin research group at Jeju University/Ewha Womans University. "This exciting news regarding former captive dolphins being successfully returned to the wild in South Korea is not an isolated incident," Ric O'Barry, founder and director of The Dolphin Project, told The Dodo. "Dolphin Project has enjoyed the same success in Guatemala, Nicaragua, Haiti, Brazil, Colombia, Bahamas Islands and in the USA." Chunsam's happy news comes amid growing controversy about keeping dolphins in captivity. Earlier this year, the National Aquarium in Baltimore announced that it would retire its dolphins to a sea sanctuary. Dolphins in the wild have complex social interactions and can swim up to 100 miles per day.